Please note that the following list is not comprehensive and is solely given as an overview of some of the most common types of hard floor machines used in today's cleaning industry. A floor buffer or rotary floor machine is a low speed machine that has a horizontally rotating head which attaches to a large, round scrubbing pad or floor scrubbing brush which spins in a circle in one direction. The spinning of the pad or brush is powered by a small motor, usually directly over the center of the machine head. Some buffers come equipped with solution tanks that can squirt floor cleaning solution directly into the scrubbing pad and onto your floor. Buffers are made to spin at a variety of speeds. The speed at which the pad or brush rotates directly affects the kind of floor cleaning job you want to do. 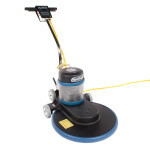 Low speed buffers operate in a side to side or "swing" motion and are designed to handle scrubbing jobs, when your floor has in-ground dirt that you need to put some muscle into scrubbing away. Low speed machines are also your machine of choice when you need to strip off the old wax coating from a hard surface, like commercially tiled floors that are often found in grocery stores. Low speed buffers will rotate from about 175 revolutions per minute (RPM). Dual speed buffers will go from about 175-350 RPM. Floor burnishers, also known as high speed floor buffers or high speed floor polishers, rotate at more than 10 times the speed of conventional low speed buffers, usually between 1,500 and 3,000 RPMs. 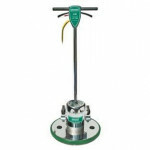 A high speed floor polisher not only rotates much faster than a low speed floor buffer but it can also weigh more. The most important aspect when creating a "wet-look" shine is pad speed, but weight and down pressure can also be a factor, depending on the type of burnisher. These machines operate in a forward and reverse motion and generally require more maintenance and upkeep than traditional low speed buffers. 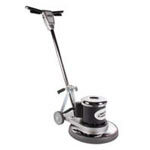 The three main types of floor burnishers are electric, battery-powered and propane. Automatic floor scrubbers, also known as auto scrubbers are a type of floor cleaning machine that have a scrubbing head and an automated system for dispensing cleaning solution and then vacuuming it up. So, in one pass over your floor, you can dispense cleaning or stripping solution, scrub it into the floor, and vacuum it all up with a floor scrubber squeegee attachment at the back of the machine. Auto scrubbers have a separate dispensing tank and a collection tank to keep your clean water from your dirty water. If you're interested in purchasing an auto scrubber please give us a call at 888-722-5508. A floor sweeper is an industrial cleaning machine used to clean a floor of large debris such as wood chips, metal shavings or paper scraps. A floor sweeper is commonly used in conjunction with a floor scrubber and can also be a part of a combination machine known as an industrial floor sweeper-scrubber. If you're interested in purchasing a floor sweeper please give us a call at 888-722-5508. A floor sanding machine is a tool that is used on a wood floor to level out the surface. There are four main types of floor sander machines. Heavy duty drum sanders are the most common type. Square pad sanders are less aggressive than drum sanders and are less likely to cause gouges in the floor. Orbital floor sanders, like the one pictured on the left, move in a circular motion. Edging sanders are commonly used in conjunction with drum sanders because they are unable to reach the wall.